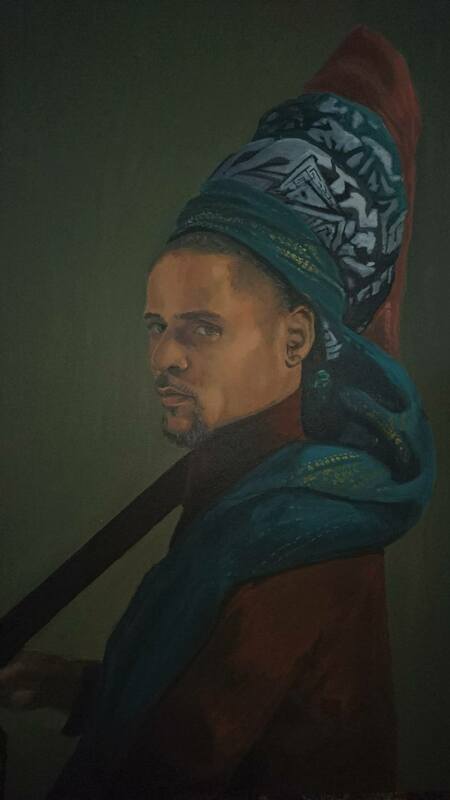 Acrylic portrait painting on canvas for black artist Amir Shakir created by Ivette Cabrera. This artwork titled “Akiro Warrior with Machete” celebrates a black warrior styled like a Moorish prince with a variety of textures and fabrics. I took the photo of Amir in my studio and recreated the image matching the color of the fabrics etc. I wanted the strong contrast of the warm tones oh his face with the green background. The machete in many cultures is a very important tool that is used to cultivate and for battle. In the most abstract concepts exists an infinity of illusions.